Braking parts are vital elements of your vehicle, as they are directly responsible for your safety. We can offer you original braking pads as well as their reliable equivalents. In our offer you can find braking pads produced by ATE, TRW, BOSCH, DELPHI, SIEGER, STEINHOF. All of them are good value for money and they are produced for all cars and delivery vans. High quality of our braking pads is confirmed by European homologation ECE-R90. Another important elements of braking system are braking discs. Due to the fact that braking discs take on huge amounts of heat that is produced during braking, the quality of casts used in their production is very important. Additionally, braking discs that are offered by Martec are precisely treated by CNC machines. Thanks to this process, our braking discs are perfect and reliable. 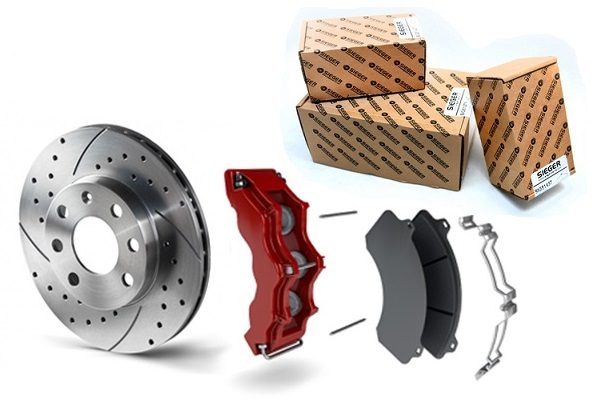 We can recommend you our best braking discs: SIEGER, ROTINGER, MIKODA, DELPHI, TRW, ATE, BOSCH which are available in traditional and tuning versions. Anytime you need to change your braking pads or discs you should get them from a reliable and trustworthy supplier. Martec supplies braking parts to drivers in Poland and abroad. Thanks you TecDoc knowledgebase we are able to verify appropriate car parts for your vehicle. We are ready to provide you with our professional help.